Is square A and B the same color or different colors? Want to bet? 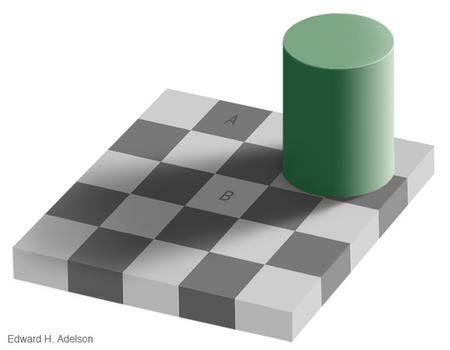 They ARE the same color, but almost all of us can't see it, before it has been proven to us, and we've stared at it another five minutes. Your brain is so good at filtering out the effects of shadows so that we can make the best possible guess at what we're seeing. So good that we actually can't see what is really there, but only what is supposed to be there. The illusion is most obvious in the large version. See here for the details, and proof of why it is so. If you still don't believe it, you'll have to download the image and cut out little pieces of it in a graphics program, and put them next to each other. using a little freeware prog called traycolor, which will give you rgb values and html hex and decimal code for any colour on your screen that you highlight, i see that yes you are right the eye decieves. On the smaller pic though, A. and B. do show as different values. As jmarc pointed out, the squares are not the same color in the first image, but are in the larger second one. In Photoshop, if you zoom in to the max, there is no difference to the eye. Ah, the discrepancy in the small pictures is because I just resized it, so it isn't the original. The big one on this page is the one that counts.